Heart disease is something that I play very close attention to. It runs on both sides of my family and I am diligent about keeping my heart healthy. When my father was only 31 years old, he had a quadruple bypass. 21 years later, he passed away at the young age of 52 years old from a Cerebral Hemorrhage caused from years of heart complications. My Mother had a stint put into her heart when she was 49. I am very aware that Heart disease is the leading cause of death in women in the United States. Even with that statistic, risk factors steadily on the rise so it is essential for women to maintain a healthy lifestyle. Campbell Soup Company is dedicated to helping women care for their hearts by providing delicious, heart-healthy foods and recipes as part of their continued support of the American Heart Association. 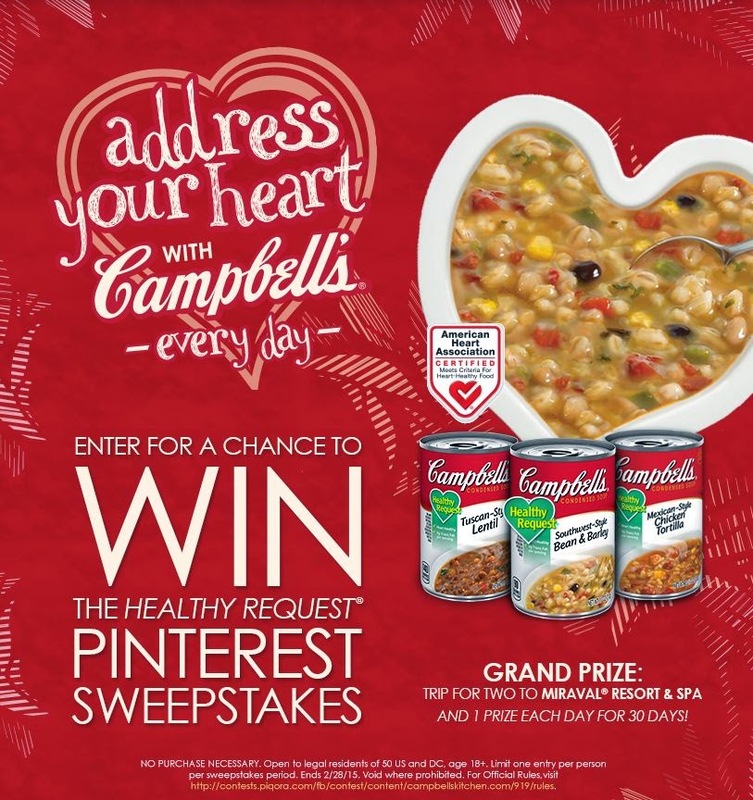 They recently launched the Address Your Heart with Campbell’s Pinterest Sweepstakes to encourage small steps towards making heart-healthy lifestyle choices. It will take place throughout American Heart Month (February) and offers the chance to win a variety of daily prizes totaling more than $100 each. 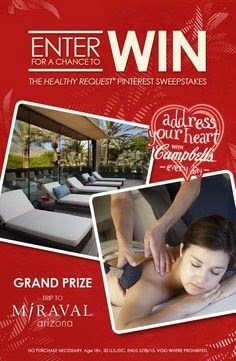 These items include heart-healthy products, bakeware, kitchen utensils and a grand prize trip for two to the luxurious Miraval Resort and Spa in Tucson, AZ. Here are a few lifestyle changes will help you start the journey to a healthier heart. 1. Use a fitness tracker I use my fitbit almost on a daily basis. I say almost because there are times I forget to charge it and leave it at home. I work from home so it is far to easy to get out of bed, walk to my desk and sit there all day. My daily goal is 10,000 steps, which is what the American Heart Association uses as a guideline for improving health and decreasing risk of heart disease. 2. Make time for "Me" Me time is essential in reducing stress and stress happens to be heart diseases best friend. While I am always stressed out, I make sure to find time for myself. It could be a 3 mile run on beautiful Bayshore Blvd in Tampa, an hour long bubble bath, relaxing with a good book or going to the beach. One of my former co-workers put 15 minutes on her calendar each day for her to take a walk. When I worked in the office daily, I also picked up that routine and it helped a lot with my day to day stress at work. 3. Take the Stairs I got this one down pat. We live on the third floor of a condo that has no elevator. While there are times I loathe the stairs (post marathon, grocery shopping), it is a great inconvenience. Stairs is an excellent source of aerobics which will make your heart happy. 4. 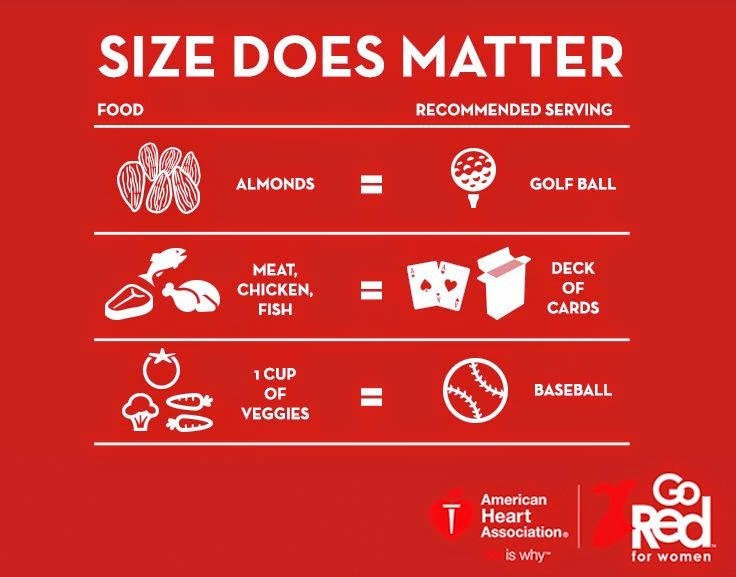 Portion Control Many of us do not eat healthy portions. It's much easier to measure out your portions while cooking at home but dining out is hard being restaurants tend to serve 2-3 times what we should be intaking. While dining out, I make a rule to eat half of my meal, taking the other half home with me. The above photo shows what our correct measurements should be. 5. Purge the Pantry Eating junk food clogs up your arteries so throw out those chips and cookies. We are diligent about not having junk food or soda in the house. If we want to have a "cheat" snack, we buy whatever it is that day, not allowing for temptation to be sitting around. Items we typically keep in the house are 100 calorie snack packs, individual packets of hummus, 100 calorie packets of guacamole, fruit, peanut butter. 6. Exercise Routine If I had a penny for every time someone said to me "I can't run", I would be a rich girl. Regardless if you decide to take up running, or find another sport, the important thing is keeping a routine. I have a journal which keeps me motivated throughout the week. Sure there are times when I would much rather curl up on the couch and watch junk TV vs. lacing up my sneakers. However, keeping yourself liable for fitness is very important. 7. Pack your lunch We started packing my husbands lunch a few months ago and it has made a huge impact, both for his health and financially. We were in shock when we budgeted how much he was spending on lunch and also for his afternoon "snack". An average of $10 a day for lunch and $5 a day for coffee and a snack. That's $75 a week or $300 a month!!! We now use a shopping list each Sunday and get enough items for him to take to work (and for me to make lunch at home). One thing to keep your eye on while shopping are items featuring the American Heart Association heart check mark.